Day 5/7 successful. 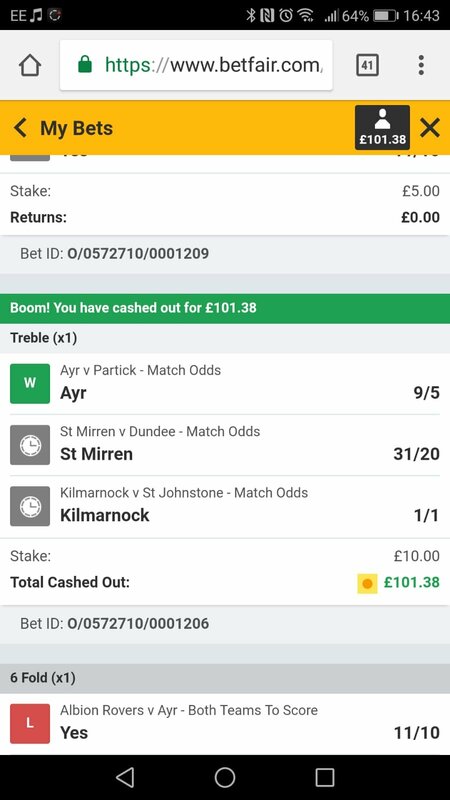 Put on a treble today. That takes me to £2.14 with two days left to get through. Got a feeling I'll be placing it on the Champions League final in some way. £3.16. One day to go. Top photo is today's bet, all or nothing now. Win and I keep the winnings, or lose it on the final day. Bottom photo is my wins/increases over the week. It's a successful week as my five team accumulator succeeds. £3.99 for the week. Got a £4.53 lead on my mate but we are still in loss on this bet. Went to Shawfield last night. My bet of choice was a £1 reverse forecast on dogs 3 (white jacket) and 4 (black jacket). Didn't come in the first 5 races but race 6...yeeeeehhhaaa, £58. New week for the £1 "Bet on Whatever the hell you like" thingy. My mate has crashed out already single on BATE BORISOV 1-1 Isloch Minsk. BATE won their opening 8 matches conceding just once before today. Quite simply his response was WTF. In the last 3 weeks he's crashed out twice on opening day and the other week seen him exit on the second day. His form is shite. Meanwhile I'm in the unknown. Tennis double for me today, one match cleared as Dominic Thiem defeated Ilya Ivashka 6-2, 6-4, 6-1 to seal it 3-0. My other match was Rafael Nadal v Simone Bolelli, Rafa leads 2-0 after winning the first two 6-4, 6-3. Bolelli leads 3-0 in the third set but rain has held it up so I shall have to wait til tomorrow to know if Monday's bet was successful. Monday bet still waiting on Nadal's match, they've just got back on court now. In the meantime I've had to place my Tuesday bet on with the proposed £1.08 I would win if Monday's bet is successful. 2/3 in so far, both tennis as MARIN CILIC beat James Duckworth 3-0 (6-3, 7-5, 7-6(4)) while in the doubles I had RAVEN KLAASEN/MICHAEL VENUS defeating Corentin Denolly/Alexandre Muller 2-0 (6-3, 6-3). The final part of today's treble is football related as I have HJK HELSINKI v Seinajoen JK. While typing this Rafael Nadal has clawed the break back in the third set. Monday/Tuesday cleared, Rafa won 3-0 and HJK eased to a 4-0 victory. £1.70 to use today. Gone with a heavily handicapped fourfold. Done over by the Austrian W. 2-0 up looking good to complete the handicap, but narrowly lost the third set 23-25 and eventually won 3-1. Everything else came in so finish 3/4 and crash out for the week. Still better than my mate though. A new week started well for both me and my mate. My mate played it safe after two opening day exits in three weeks (and a Tuesday exit on the other) and went with Rafael Nadal to beat Maximilian Marterer at 1/100, winning him 1p and giving him £1.01 for today's bet. I had the same match but went with Both Players to Win a Set - No (better odds than 3-0 to Rafa and Marterer not to win a set). I'm on £1.24 for today. Feckin shite. Had Dominic Thiem v Alexander Zverev - Both Players To Win A Set - Yes. Thiem won 3-0 ffs. My mate is up to £1.06 after a double on Sparta Prague U19s (2-0) and Norway W U19s (5-1) came in. After my Tuesday exit my mate only managed 1 day further as his double involved Nadal (won) but also a Philippino basketball team who lost 84-86. 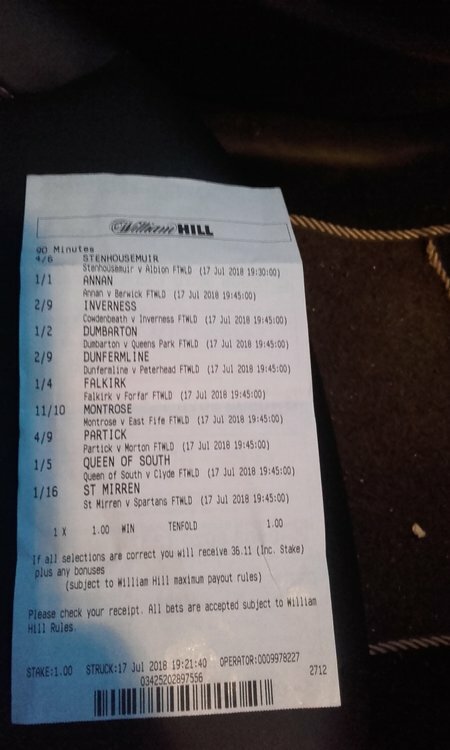 New week - My mate took an easy option to get by Monday, going with "Will this game go to overtime? NO" in a Lithuanian basketball match. 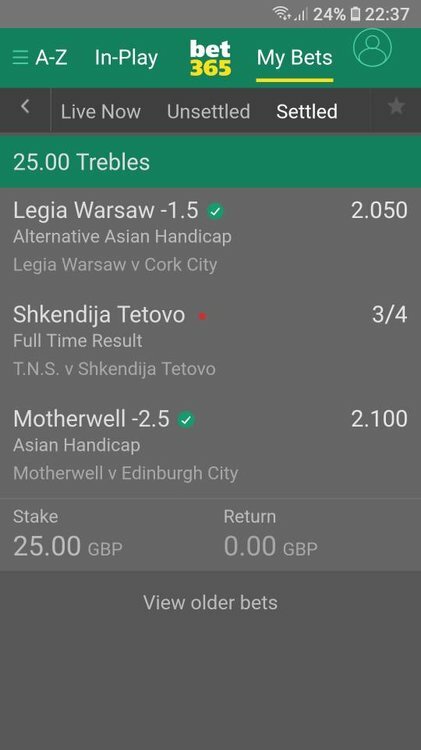 As it happened Lietuvos Rytas defeated Zalgiris Kaunas 82-73 in normal time and my mate gained £1.02. He has an accy of 4 today, all involving the Women's World Cup Qualifiers. I originally betted on tennis yesterday but due to the weather in Stuttgart the match never got started. I had to choose something else so I decided on Belgium v Costa Rica - Will there be a goal between 00.00 and 4.59 - NO. Success, £1.10 to use today. I have a treble involving two tennis matches (including the one that didn't start yesterday) and an U20 Rugby Union World Championship match. Tuesday was successful too. My mate picked out four Women's World Cup Qualifiers, three of them won easily. The surprise which nearly cost him was Netherlands W 1-0 Slovakia W, Lieke Martens goal on 90+2 saving him from the exit. He had £1.20 for today. I came through Tuesday with a double/treble. Italy U20 15-44 AUSTRALIA U20 in Rugby Union World Championships was good for me as was tennis doubles match LUKASZ KUBOT/MARCELO MELO 2-0 Yuichi Sugita/Donald Young (6-4, 6-2). What shafted my potential earnings was a delay for the second day running of Gunneswarn v Shapovalov in the tennis as once again the match didn't start. Our rules mean we have to cash out because the match didn't start, leaving me on £1.33, a gain of 23p. Today we have the same two teams, but I had a third on top of that. We are sat on 1/2 and 2/3 respectively while our last match begins at 9.40pm. I'm up to £1.35 after yesterday's success. Two Volleyball matches (Brazil W 3-1 Thailand W and South Korea W 0-3 USA W) and New Zealand W beating Ireland W by 305 runs in cricket. Today I have a single on Poland W to defeat Dominican Republic W, once again in Volleyball. My mate is on £1.21 after also having the two Volleyball matches I had. He has a double today, Serbia W in Volleyball and a Greek basketball match to avoid the need for overtime. Both of us taking the week cautiously so far. I'll join you in crying. Tetovo beat TNS 5-0 last week. 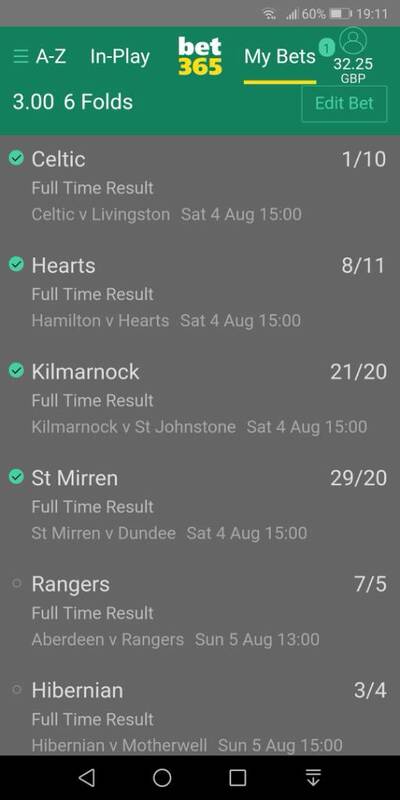 Would have won £190. Bottled it and cashed out. Good start to the season though. Very nearly a perfect day yesterday. I had St Mirren , Hearts , Airdrie and Ayr BTTS and W.
Partick Thistles inability to score a goal cost me £2350 for a fiver bet. or do I cash out for fear of Aberdeen blowing the lot? That's a tough one. The Aberdeen game is hard to predict. No it isn’t. Just like last season, an otherwise half-decent Aberdeen will shite it against the uglies. Sevco to win by two. 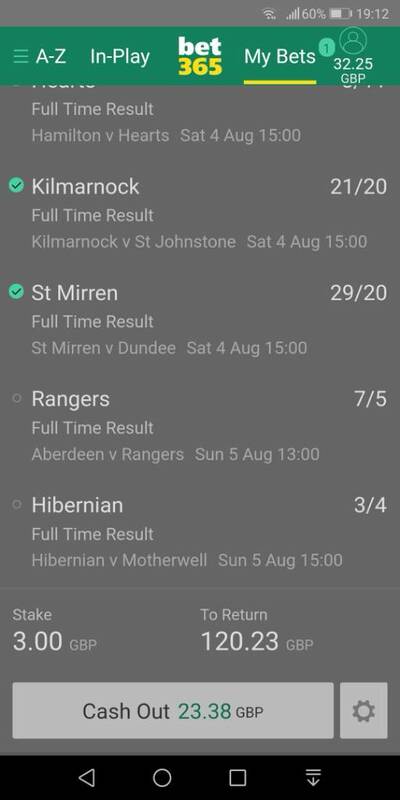 After his post I'm away to stick money on Aberdeen. In the 90th minute I was offered £60 to cash out my £3 bet! I thought I'd take a lesson from Sammy at the penalty and not blink! Thanks for your advice, I went for the draw.